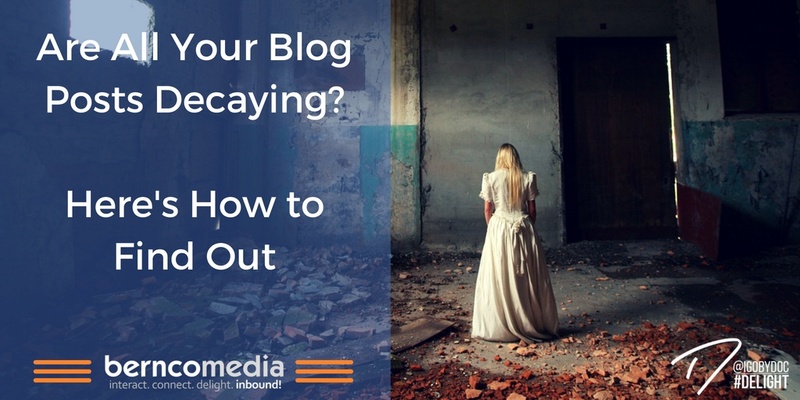 Most of your blog posts are decaying. If a blog post is generating less traffic than it did when first published, it's in decay. But the most effective blog posts are compounding. Understanding the difference between decaying and compounding blog posts is vital for an effective content marketing strategy. What Are Decaying Blog Posts? It's not just you. The majority of blog posts produced are in decay. They receive the most traffic right when they are published, but then the number of views and shares only declines, sometimes very rapidly. Many marketers make the mistake of assuming that this is the natural trajectory of all blog posts. They focus their efforts on producing new content so they can keep receiving small spikes in traffic. But a compounding blog post has a very different lifespan. What Are Compounding Blog Posts? Compounding blog posts gradually generate more traffic over time. When first published, they may receive an equal or even lower amount of traffic compared to decaying posts, but as time goes on, more people take notice. As more visitors discover, like, and share your content, compounding posts reach a wider audience and consistently direct traffic to your site. Are the Results of Compounding vs. Decaying Posts Really that Different? Yes, significantly. Over its entire lifetime, a compounding blog post can generate as much traffic as six decaying posts. According to a HubSpot study in 2016, compounding blog posts only make up 10 percent of all blog posts, and yet produce 38 percent of traffic. What Makes a Compounding Blog Post? Compounding blog posts remain relevant. The topics covered are evergreen. While time-specific, news-like posts have their place, these will become outdated. Posts related to current events tend to decay very rapidly. A blog post on "Best Charcoal Grills of 2018" will generate significantly less traffic in 2019, while another post titled "Best Charcoal Grills" can remain relevant for years to come. Of course, it's up to you to update the post as needed so your content, not just your headline, remains useful to readers. General, broad topics are also vital to producing a compounding post. Write for large segments of your target audience. Don't be tempted to create content so general that it could apply to everyone, but do avoid very niche topics that would only interest a small fraction of your market. Be helpful to your audience. While visitors may also read for entertainment or to stay informed about a topic, blog posts that provide concrete value draw the widest audiences. Guides and how-to articles perform well online, as people have increasingly turned to the internet to answer their questions. How Do I Write Compounding Blog Posts? 1. Keep your headline under 13 words. While 11- to 13-word posts tend to perform the best, post titles between 3 to 10 words don't lag far behind. However, posts 14 words and longer don't receive the same levels of traffic as their shorter counterparts. 2. Consider including a question in your title. Question words (who, what, when, where, and how) attract a greater audience than headlines that are a simple phrase or statement. Lists and tips also perform well. 3. Avoid a time-specific headline if possible. Unless the content of your article is focused on recent events, leave out time markers. Seasonal headlines can generate traffic every year, but those with a date or current event reference become irrelevant. 4. Answer a question. Write a blog post that answers a common question about your business, product or service, industry, or otherwise related topic. Instead of a simple FAQ page, you can address frequently asked questions in more depths by dedicating a blog post to each question that has enough substance. 5. Address follow-up questions in the same post. When writing a question-based blog post, consider what follow-up questions your reader may have. Then dedicate space in that post to those additional questions. A blog post should remain focused on one topic, but addressing a question in-depth will help your content stand out from your competitors. 6. Stay up-to-date. The content you produce today may not remain relevant for years to come. That's fine. But revisit old but well-performing content and update it when necessary. Not every blog post you publish will be a compounding post. But add compounding posts to your content marketing strategy, and you'll set the stage for increased traffic, greater visibility, and improved SEO. For more information on developing a content marketing strategy for your business, contact our team today.